Located in the center of District 10, it has a prime location with outstanding advantages in a space full of sun, windy and green. 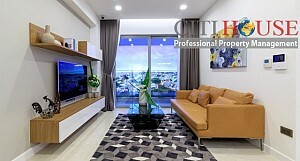 Rivera Park Sai Gon is giving the owners a perfect life, full of modern facilities, enjoy the green space on the doorstep. The main idea is to design the Rivera Park apartments in the open space trend with the scientific layout, reasonable to maximize the effective use of space. The apartments are designed with enough space but not restricted with very airy and able to receive good natural light, contributing to minimize the use of artificial light and air conditioning. With the desire to create value for the living, with the motto of living quality is a priority, Rivera Park apartments offers the utilities needed for daily life and provides the perfect service to share the needs of residents. Modern life is always busy hustle, so most customers when choosing apartments are looking for a living space not only comfortable but also full of utilities, helping them less anxiety and savings. Understanding the aspirations of future residents, Rivera Park Saigon brings the practical amenities in perfect quality: Club House; Gym; Pool; Green Park; Play kid area. Please kindly contact us at: 0909 288 281 / 0907 018 592 (Viber/Zalo/Whatapps) for more information.